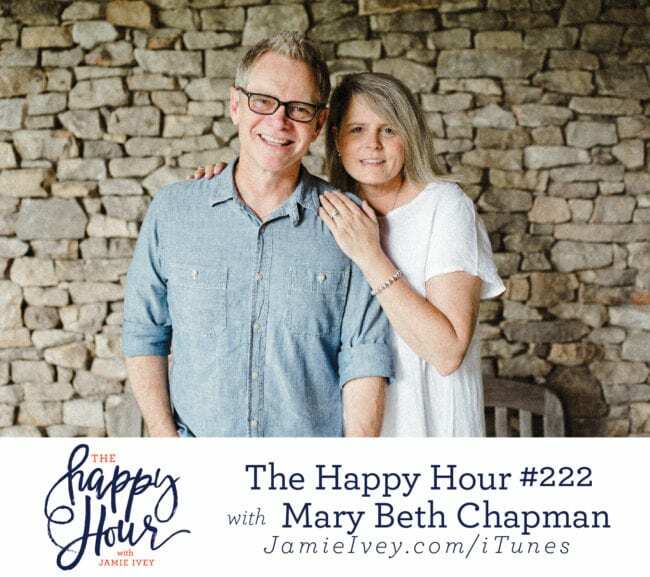 My guest for The Happy Hour # 222 is Mary Beth Chapman. Mary Beth is President and Co-Founder of Show Hope, wife to Steven Curtis Chapman, a New York Times Best Selling author, speaker, advocate, and momma. Steven and Mary Beth reside in Tennessee and have six children: Emily, Caleb, Will Franklin, Shaoey, Stevey Joy, and Maria. Mary Beth and I start off the show talking about Mary Beth's current season of life and she is living my dream - her kids and grandkids all live in the same city as her! Mary Beth shares the story of how they came to adopt three of their children as well as creating Show Hope, a non-profit that seeks to care for orphans by engaging the church and reducing barriers to adoption. In the second half of the show Mary Beth opens up about the pain and grief she and her family have walked through in losing their daughter Maria. I appreciated her honesty so much as she described her relationship with God as knowing she fully trusts Him while simultaneously having the emotions, questions for God, and pain. Mary Beth and her family have endured a terrible tragedy, but amidst the pain, you'll hear Mary Beth describe so many ways God has continued to pursue them, shown such kindness, and brought hope and encouragement. Fab Fit Fun - Code: IVEY for $10 off your first box!